While it may not be the bow you would get for competitive archery, the SAS Explorer Metal Riser is the right model to pick for someone who is just looking for a good bow for target practice and low-key hunting. It is affordable, which means that novices will not be put off by the hefty price tag, and it also comes with a nice design that will catch your eye. Seeing that it is 66 inches long, it is designed for tall people, something that might not be easy to find, especially in the price range of this budget-friendly option. 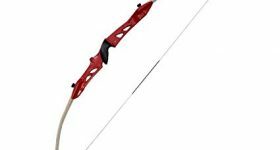 Durability is one crucial aspect of any recurve bow you may happen to set your eyes on. Flexibility is the other that you should never compromise. It is an excellent thing that this bow has them both, which means that you will be making a sound investment if you decide to purchase this one instead of others. Because its limbs are made of maple, you can expect this bow to accompany you on many backyard hunting sessions. The limbs are also reinforced with fiberglass, and they will bend time after time whenever drawing the string. That, however, doesn’t mean that you should worry that the limbs will break. Flexible, yet durable, this takedown model will help you stay in the game for as long as you want. Also, the riser is made from aluminum, so it doesn’t weigh down the bow but does serve for increased robustness for years to come. 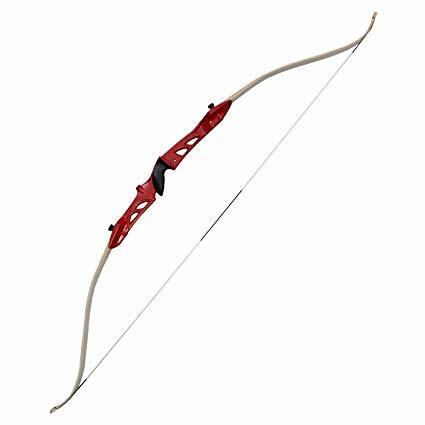 The recurve bow we’re reviewing here has 66 inches in length, and that makes it a good option for taller individuals. While you might not expect it for the price, the wooden limbs are polished to perfection, and you can tell from one glance that the manufacturer didn’t spare the extra craftsmanship to make the model attractive. It is available in five different colors, including a camo option, so it will be easy for you to pick one that is just what you want, depending on your style preferences. It must be mentioned that this model is designed to serve only right-handed shooters, so, unfortunately, left-handed archers must look somewhere else. You will like the fact that this bow comes in different draw weight configurations. They vary between 22lbs and 34lbs, and that means that you will be able to pick a model that you can easily string, depending on how strong you are. That also gives new archers room to grow and offers a lean learning curve, which is why this bow is recommended for target practice. Since this is a takedown model, that means that the bow needs assembly. But don’t worry; once you learn how to put together a takedown bow, you will have no issues with any other similar models. So, all in all, this is what makes this bow a good pick for beginners. Other things you need to know are the increased accuracy you will experience while shooting and the overall excellent performance it offers. If you get a bow for the first time in your life, you should go for an option that can assist you in honing your skills quickly, as an archer. And this particular bow does precisely that. There are no mentions for users regarding noise and vibrations, and that’s a great thing. While you should not expect to be able to take this bow along for big game hunting, all the hunting you can do in the backyard can be carried on with the SAS Explorer Metal Riser. Any prey and even varmint can detect noise rather quickly, which is why you need a model that is silent and easy to use. Once you get used to how this model works, you should encounter no issues with getting close to prey and shooting it down. The SAS Explorer Metal Riser is a good option if you are a beginner. It can be used by people as tall as six feet, which is seen as a plus, and it is a takedown model. You can see, right from the start, that the manufacturer spared nothing for this bow, as its polished design can vouch for. Suitable for target practice, as well as some backyard shooting, it is the type of bow that you won’t regret picking up. Its affordable price only comes to complete the picture of a decent bow.